Silver Wisp Jewelry - This is a delicate sterling silver handmade pendant that is accented by a round faceted Lab created London Blue Topaz set in a 4-prong setting. This eye-catching necklace comes with an 18" sterling silver snake chain. 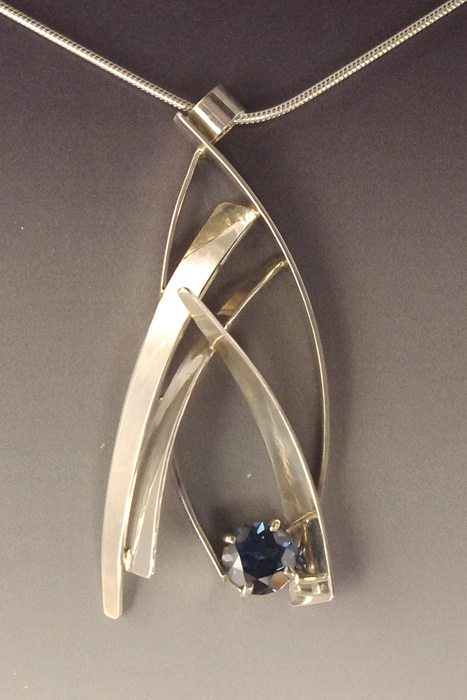 From our "Silver Wisp Collection", a Handmade Sterling Silver Pendant (2.25" long x 1" wide), with a Lab Created faceted round (8 mm) blue topaz set in a 4-prong setting. This beautiful classic pendant has High Polished Sterling Silver and comes with an 18" sterling silver Snake chain. This necklace will add sparkle to any outfit. Matching earrings and rings are available. This necklace is an artistic work of art and is signed and handmade by Aaron Rubinstein and Modern Art Jewelry.